In 2011 the German film maker Wilfried Huismann released his documentary film exposé of WWF, The Silence of the Pandas. The film highlighted the devastation caused by the expansion of GM soy in South America and WWF's collaboration with Monsanto in the Round Table on Responsible Soy, an industry-led greenwashing forum that tries to portray GM soy as "responsible". Now Huismann has published an English language book on his investigations. It's available as an e-book or in a Kindle edition from Amazon. Paperback version available soon. An important article has been published in Nature journal. “Cross-bred crops get fit faster”, by Natasha Gilbert, explains how genetic engineering lags behind conventional breeding in efforts to create drought-resistant maize for Africa. The article foregrounds the Drought Tolerant Maize for Africa project, launched in 2006 with $33 million. The project has developed 153 new varieties to improve yields in 13 countries. In field trials, these varieties matched or exceeded the yields from commercial seeds under good rainfall conditions, and yielded up to 30% more under drought conditions. 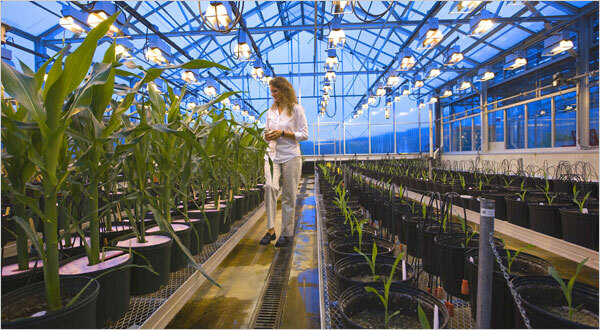 Gilbert reports that the International Maize and Wheat Improvement Center (CIMMYT) in Mexico City and six other research organizations are also developing GM varieties of drought-resistant maize, in collaboration with Monsanto. But any GM variety that comes out of the project won’t be ready for African farmers before 2016 “at the earliest”. So much for the GMO lobby meme that GM is quicker and more efficient than conventional breeding! There are many more non-GM successes in the GMWatch database. In two articles below, Prof Jack Heinemann challenges popular GMO lobby memes and dishonest PR tactics. In the first article, Prof Heinemann takes on Monsanto PR woman Janice Person over her suggestion that opposition to GMOs is comparable to opposition to vaccines. He also explains why opposition to GMOs is not equivalent to "climate denial". In the second article, Prof Heinemann asks whether attacks on Reuters journalist Carey Gillam by the blogger Keith Kloor and the former Vice President for Food & Agriculture of the Biotechnology Industry Organization (BIO), Val Giddings, have any credibility. Gillam has fallen foul of these people because she presents both sides of the GMO issue. A recent exchange over at Twitter illustrates what can happen when expression of controversial opinions causes conflict in the media. In this episode, those serving as critic and conscience of society are not the direct targets. Instead, the journalist becomes the target for having mentioned that these other opinions exist. Ante el reto de la agroecología, los defensores de la obsoleta agricultura industrial tóxica se quedan sin argumentos. En lugar de recapacitar, algunos toman refugio en el cómodo argumento de que se puede combinar ambas, tomando lo mejor de una y la otra para así llegar a una síntesis armoniosa. Con ese hábil discurso, que nos dice “podemos tener ambas agriculturas, dejen de pelear”, los proponentes de la producción agroecológica somos presentados como intolerantes que nos queremos imponer. Pero los datos científicos muestran claramente que no hay coexistencia posible. 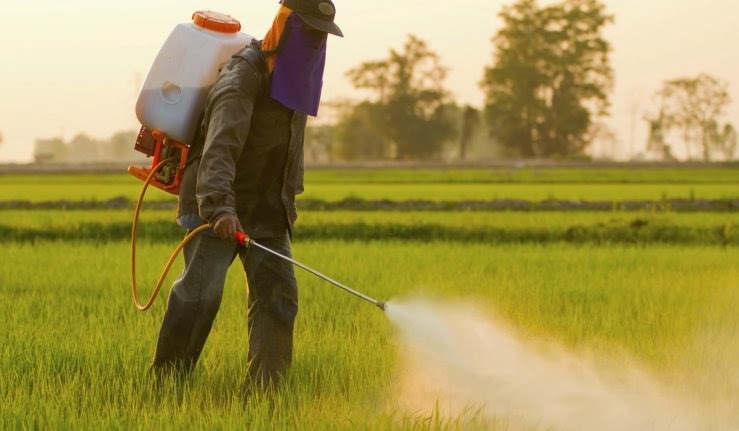 Los pesticidas agrotóxicos empleados en la agricultura industrial eventualmente acaban contaminándolo todo. Researchers from the University of Illinois report that an invasive weed called Palmer amaranth (Amaranthus palmeri), which is showing growing resistance to common herbicides, including the widely used glyphosate, has “devastated cotton production” in the southern USA and is spreading at an alarming rate now across the Midwest. Already, it is found in 23 states. Palmer amaranth is a prolific seed producer which can tolerate heat extremes, grow up to 2.5 metres tall and is challenging to remove. For instance, it cost the state of Georgia at least USD 11 million in 2009 to manually remove it from one million acres of cotton fields. The weed can decrease soybean yields by 78% and corn yields by 91%. An article in Nature states that the spread of resistant weeds like Palmer amaranth can be traced to the widespread cultivation of crops genetically engineered (GE) to be resistant to glyphosate, citing that glyphosate-resistant weeds had infested 25 million hectares of US cropland by 2012. 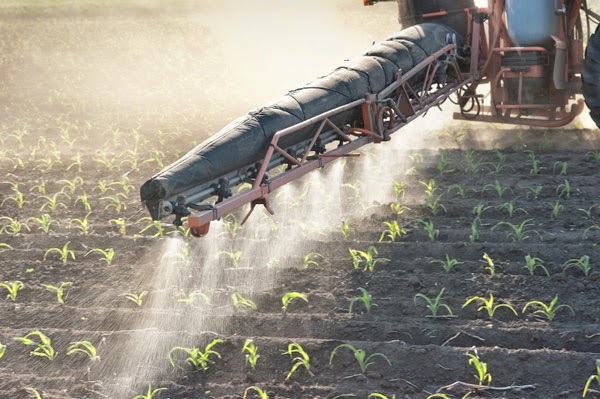 The article questions the proposal to develop GE crops made resistant to multiple herbicides as this is likely to be a flawed solution which will instead fuel the spread of more herbicide-resistant weeds. It calls on the Environmental Protection Agency to do more by way of integrated pest management. The article is available at http://www.nature.com/news/a-growing-problem-1.15382. EXCERPT: Companies and universities conducting field trials usually are eager to remedy problems and avoid further scrutiny. That apparently wasn't the case last year at the University of Florida, which received a formal letter from APHIS about its failings after a tomato researcher told an inspector that he didn't plan to monitor adjacent land for unwanted volunteer plants and intended to lie about it if asked. 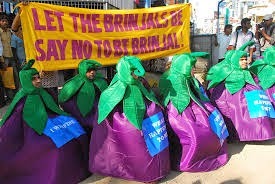 Farmers in Bangladesh who were given Bt brinjal plants have demanded compensation for huge losses they incurred cultivating the GM crop. 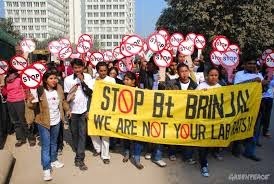 British pro-GMO campaigner Mark Lynas presented the Bt brinjal as a success, claiming that reports about its failure were false "scare stories" put about by anti-GMO activists. However, an investigation by The Guardian newspaper (UK) confirmed the widespread failure of the crop. EXCERPT: [Bangladesh Environmental Lawyers Association] chief executive Syeda Rizwana Hasan said they would go to court if the government did not compensate the farmers. Demanding Bt brinjal cultivation to be stopped, she said that the government was adamant to cultivate the controversial crop despite public outcry and failure in its field level cultivation. Farmers, who were given Bt brinjal saplings, on Sunday demanded compensation for huge losses they incurred cultivating the genetically modified crop. La relación que tenemos con los alimentos y la forma en que los producimos está sometida a presiones crecientes. Fenómenos meteorológicos extremos, cambios en el clima y el crecimiento demográfico mundial ponen en riesgo la soberanía alimentaria de las comunidades. Al mismo tiempo, los expertos en salud cuestionan seriamente nuestra dieta moderna. La Organización Mundial de la Salud (OMS) advierte de una “epidemia mundial de obesidad”, aunque se estima que 868 millones de personas padecen hambre crónica. Por eso quizás no debería sorprender que se reclamen cambios fundamentales en la manera como producimos los alimentos y alimentamos al mundo. La industria de la biotecnología se ha colocado a sí misma en el centro de este debate. Las empresas de biotecnología trabajan con gobiernos y la comunidad internacional de asistencia en iniciativas que según ellos mejorarán el rendimiento y los niveles de nutrición. Sus promotores sostienen que los cultivos transgénicos (genéticamente modificados) pueden ayudar a alimentar un mundo limitado por el clima. In April this year, a Mexican court upheld an injunction issued in October 2013 against the further testing or commercialization of genetically modified (GM) maize in the country citing "the risk of imminent harm to the environment" (Item 1). In 2009, the Mexican government approved applications by Monsanto and other corporations to conduct experimental trials on GM maize in six northern states. The government was on the verge of granting approval for the large-scale commercial planting of GM maize in these states when the injunction was issued last year. The court order was the result of a class action suit filed by 53 citizen plaintiffs, including farmers, environmentalists, and consumers on the grounds that the approval of permits for planting GM maize had violated Mexico’s biosecurity law of 2005. The law provides for the special protection of maize and stipulates that GM maize is not to be sown in proximity to any area known to be a "center of origin" for maize. Scientists from the National Commission on Biodiversity (CONABIO) have pointed out in a recent paper (Item 2) that Mexico is a center of origin and diversity for maize and other crops. They warn that given the “agricultural, cultural, and historical contexts that surround maize production in Mexico,it will be very difficult (if not impossible) to control gene flow if commercial releases (of GM crops) take place, and this could threaten food security for all those that depend on its production through landraces”. How Much Can GMO and Non-GMO Cultivars Coexist In A Megadiverse Country? Devon Peña’s Note: The Seed Savers Exchange has actively served the nation’s farmers, gardeners, plant breeders, and seed librarians since 1975 as a reliable source of non-GMO heirloom seed. The Seed Savers released a statement in support of seed libraries last week. I am reposting their eloquent declaration in defense of seed libraries; for the original, please visit the Seed Savers home page. 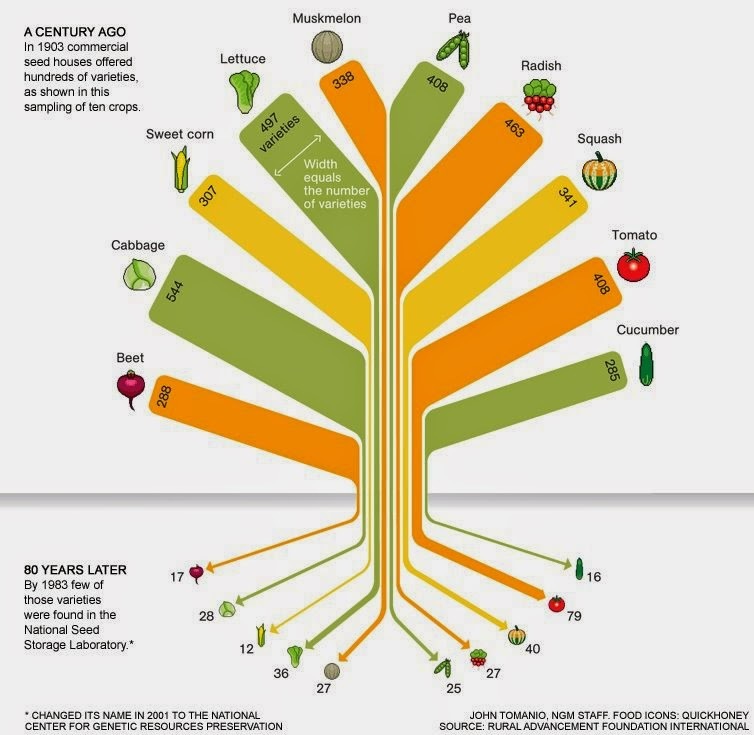 biodiversity we have seen under the practices of commercial seed houses. On August 5, I reported on the closing down of a seed library in Pennsylvania by the state’s Department of Agriculture. A week later, August 13, I posted an analysis and position paper on U.S. seed laws prepared by Sustainable Economies Law Center (SELC). 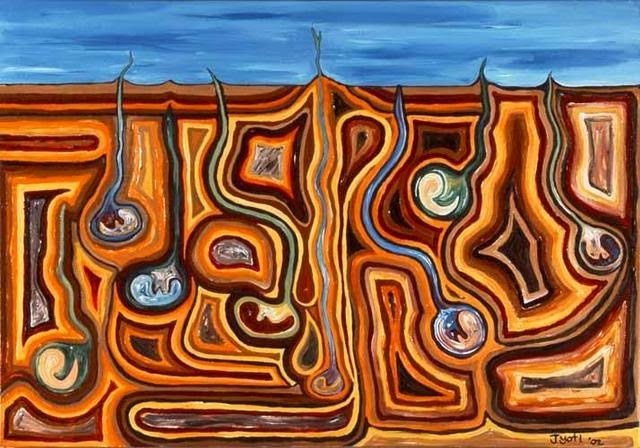 Continuing with this series on Seed Sovereignty in the U.S., I am posting this call for a discussion of a National Seed Library Protocol prepared by Leslie Goldman affiliated with the Seed Library Social Network (SLSN). The call was posted on August 27 on the SLSN homepage. I have re-posted Leslie Goldman’s announcement and call for discussion below (unedited). Goldman also reports on initial email correspondence with state officials in Pennsylvania.